Customer Centric...Demand Driven...Outside-In...Is there a Difference? Lora Cecere of Supply Chain Insights recently came out with crisp definitions of the next generation concepts in Supply Chain. These concepts are overlapping, yet different, and often lead to confusion within Supply Chain Transformation teams. GitaCloud leads with transformative outside-in processes like Demand Sensing. We see the confusion first-hand and applaud Lora's effort to drive clarity into the conversation. There is greater value when the processes use independent channel signals, as opposed to dependent demand (orders and shipments), and build value networks to connect/orchestrate across buy- and sell-side relationships. The most value is at the center of the overlapping circles in the picture above. See Glossary below to help ground supply chain transformation conversations. While many practitioners bandy these concepts around in discussions on supply chain strategies, it is important to be grounded in definitions. Demand-Driven Processes: A Demand-Driven Value Network that senses demand with minimal latency to drive a near real-time response to shape and translate demand. Market-Driven Processes: An adaptive network focused on a well-defined value-based outcomes. The network senses, translates, and orchestrates market changes (buy- and sell-side markets) bi-directionally with near real-time data to align sell, deliver, make and sourcing organizations outside-in. Customer-Centric Supply Chain Processes: A value network governed and defined by customer segmentation and a clear understanding of what drives value for the customer. Inside-Out Supply Chain Processes: Supply chain processes driven and governed by the inside-out signals of demand: orders; marketing and sales input; and financial budgets. Outside-In Supply Chain Processes: A supply chain process driven and governed by market signals with minimal latency. Demand Networks. A demand network translates demand across multiple parties. The focus is on channel data: price; inventory positions; and policies. The use of advanced analytics enables the sensing of out-of-stocks. As markets shift, a demand network enables a clear understanding of market positions with minimal latency. It is about much, much more than Vendor Managed Inventory (VMI) or Collaborative Forecasting and Replenishment. They are the most prevalent in the consumer electronics industry. Social Listening. The use of unstructured text mining, and sentiment analysis, to understand and listen to customer responses to products and services in near real-time. Advanced companies are building cross-functional teams to use unstructured data to analyze warranty, quality and service failures. Market Drivers. To become outside-in, the primary signal for demand becomes a market signal. The value network is triggering off of market signals which represent independent demand. In contrast, the traditional supply chain forecasts using historical orders and adjusts based on sales forecasting. This introduces demand latency into the supply chain. The order translation from the channel based on replenishment points is order latency. For most companies it is weeks and months, but can be multiple quarters. Channel Sensing. Channel sensing enables the use of channel consumption, and the modeling of inventory across channels, to understand global and regional trends to maximize opportunity and mitigate risk. Channel sensing combines VMI, CPFR, and the use of channel signals into a holistic demand signal. Cross-Channel Management. The corporate ability to understand the customer across channels. An example is the understanding of the shopper across the moments of truth in omnichannel strategies. Customer Segmentation. Rationalization of customers and the translation into priorities for orders, Available-to-Promise (ATP), production scheduling, and inventory allocation. Order Policy. The use of customer segmentation strategies to define order policies for lead times, discounts, allocation, and shipping priorities. Cost-to-Serve. Analysis of the relative costs to serve customers and a data-driven process to reduce and manage costs at specific customers. Customer-Driven Available-to-Promise. The use of customer segmentation to determine priority in matching inventory with orders during the order cycle. Use of Channel Data. The harmonization and synchronization of channel data to be used in forecasting, replenishment, and inventory planning. Demand Sensing. The use of pattern recognition and advanced analytics to analyze order patterns to translate tactical demand planning (forecast) into a short-term, and more accurate demand signal for replenishment. Demand Shaping. The use of price, promotion, sales/distributor incentives, new product launch, marketing campaigns, or positioning to elevate and improve baseline demand. Demand Translation. The translation of independent demand into cycle stock reduction in production planning and material buying in demand-driven MRP. Attribute-Based Planning. Modeling based on attributes (abstraction from item/location logic termed SKUs) to better see patterns in demand and supply planning. Push/Pull Decoupling Points. Choices on when to push, and when to pull, with translation into inventory policy and decoupling points. This requires modeling and continued refinement. Supply Chain Visibility and Supplier Connectivity. The sharing forecasts in supplier relationships is of little value. Instead, companies link suppliers to multiple signals: manufacturing production plans; distribution requirements; and current inventory positions, to help suppliers better plan for supply. 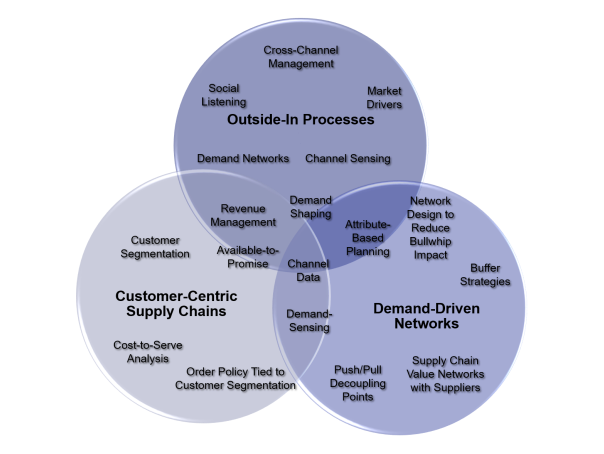 These Supply Chain Operating Network Strategies enable multi-tier many-to-many enablement of first and second/third tiers of suppliers of services, materials, and transportation. Buffer Design. The design of buffer strategies–capacity, inventory, and supplier relationships–to absorb demand and supply variability. Network Design to Reduce the Bullwhip Effect. The design of the network to reduce nodes and improve B2B connectivity to align the network and maximize agility.